Whenever there is an opening in the K-9 Unit the first thing we do is look for a new K-9 handler. 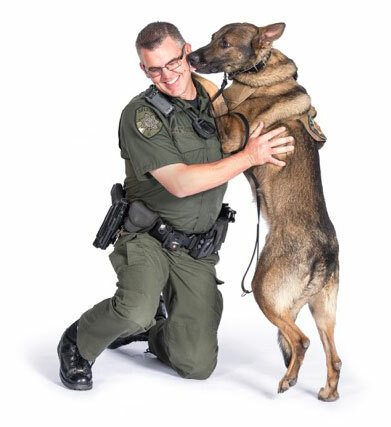 In a perfect world, a new handler would be a deputy who has shown interest in the K-9 Unit by attending trainings, assisting with hiding narcotics, setting tracks, and most importantly wearing the bite suit to assist with the apprehension training for our K-9s. This is not always the case however. We look for is a deputy who has some tenure working on the road and we prefer a 3-year minimum of experience since by this time they have come across a variety of calls that they would encounter as a handler. The work ethic demonstrated by a deputy is crucial and we look for proactive deputies who want to seek out those committing crimes instead of only responding to the calls. We have learned that the proactive deputies are also the ones who put in the extra time with their canine partners to work on different skills to make the team better. Each handler goes through a file review and an oral board with supervisors of the K-9 Unit and other members sometimes made up of past handlers, representatives of Franktown Animal Clinic or other Command Staff at the Sheriff's Office. How do we choose the right dog from Vohne Lichne Kennels? Once a handler is picked the next task is pairing them up with the right partner. This is probably the most difficult part as we do not have a history with the dogs we are looking at like we do with the handlers. Another issue we face is narrowing down the large pool of candidates. We have been fortunate using Vohne Liche Kennels (located in Indiana) and they have a wide array of talented dogs for us to review. We have an established relationship with the team there and they know beforehand what we look for in a dog. Members of our team and and a member from K-9 Friends will then travel to Indiana to take a look at the available dogs and ultimately choose one to join the team. Vohne Liche Kennels prides themselves on having strong "social" police dogs which mean they are great at their job and have the temperament where they can be around other people and dogs without issues. This is important due to the fact we do a lot of public demonstrations, participate in local meet-and-greets including the annual Howling Good Time K-9 Friends gala and most of our handlers have families with small children and other pets. When we arrive at Vohne Liche Kennels we are usually given a list of dogs for our selection testing. We are then able to walk around the kennels and look at our list in addition to all of the dogs there. We look for a variety of behaviors that the dogs display inside their kennel, whether they are timid or skittish, overly aggressive, happy to see people, or barking because that is what everyone else is doing. We write down the names of the dogs we would like to test and inquire about them. Some of them may only have detection skills or could be already spoken for by another agency or the government. We prefer "green" dogs, or dogs without prior certifications specifically for sport work as they have not performed well for us. In the next blog I will discuss the variety of tests we use on each dog. Stay tuned….